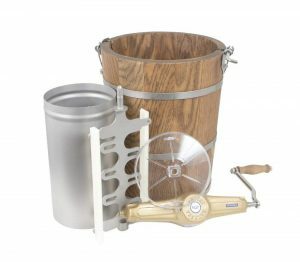 The 6-quart capacity “Made in the USA” Ice Cream Churn by the Country Freezer Co. is the latest release model with a classic wooden tub as part of its traditional Amish design, crafted in Ohio and that operates manually with a hand crank. It has a heavy 3/4” white oak tub with the rustproof zinc gears on the manganese-bronze alloy gear housing and a very heavy stainless steel can with a transparent lid, so you see what’s going on without needing to open it. The heavy-duty stainless steel bands are adjustable and there is a positive locking tub latch. This is basically an old idea with a traditional design with the latest technology added to it, such as the use of better quality durable rust-proof components. The stainless steel single piece canister comes with the nylon scraper blades that have the approval of FDA. Tall design is good for freezing faster and maintaining the temperature. It is a very good quality product that comes with a warranty of five years for the stainless steel bits and a warranty for all the other parts. If you like the classical Amish wood design ice cream maker with the latest technology and if you have the budget for it, this Country Freezer Co. Ice Cream Maker is well worth considering. If anything goes wrong with any parts you can find the replacement parts from the seller or the company directly. 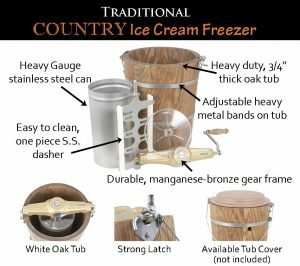 As a heavy-duty oak unit, the Country Freezer Co. Ice Cream Maker weighs 28.5 pounds and measures 22 x 15 x 15 inches. It is one of the smaller wooden tub ice cream makers by Country Freezer and makes it convenient to be used for outdoor parties or to take out and about to picnics etc. The one-piece stainless steel dasher is easy to clean and maintain. You can choose to get the poly-insulated or the white oak barrel at the same price and you’ll get a warranty of lifetime for the poly-insulated. You can also get it with a stainless steel top rather than the see-through lid. Customer reviews on the company’s website are mostly positive by happy customers. It is a sturdy, well-built and durable ice cream churn that works well and make two quarts of ice cream in less than twenty minutes. Many people that used other ice cream churns comment on the durability issues with the latches breaking or gears stripping. This Country Freezer brand unit has much better latches and gears with no flimsy or loose parts, everything built to last many long years. Despite the high price tag, it is certainly a long-term investment. The quality of the ice cream is also great as it is reported to make very nice tasting ice cream with the best texture. You’ll get the unit very well packaged and shipped to your address very fast via Amazon.com.